Wide hot melt adhesive coater laminator. Universal Converting Equipment Ltd manufacture a range of hot melt adhesive coating and laminating machines from widths of 12mm to over 2500mm. 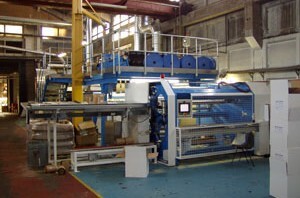 The CL1600 is an example of a wide web machine suitable for high speed production. 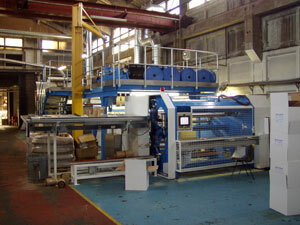 The machine is available in several configurations to suit the precise customer requirements. Hot melt adhesive can be applied using proximity coating slot dies or non-contact spray technology such as ITW Dynatec Dynafiber. Turret unwind and rewind systems are available for high speed non-stop production. Turret rewind system with automatic core loading and roll unloading.